My wife has some fond memories of visiting her grandparents. They lived in a remote northern community surrounded by beautiful woodlands and tranquil lakes. It was a great place for her to visit in the summer, but without a stockpile of wood it wouldn’t have been a pleasant place to stay on a cold winter’s night. The home’s only source of heat was a woodstove in the kitchen and it had to be constantly replenished. Her grandfather didn’t believe in using power tools unless he had to, but when it came to making sure he had enough wood for the fire he always relied on a chainsaw to get the job done. We don’t rely on a chainsaw to cut enough wood to keep our home warm these days, but it’s still nice to have a reliable chainsaw around when there’s some wood that needs trimming in the backyard. The Sun Joe SWJ701E Electric Chain Saw is a viable alternative if you’re on a budget. This is normally priced at less than $150. The length of the blade on this chain saw is about 18-inches, which makes it perfect for small to medium cutting jobs. It’s certainly longer than the blade on my first chainsaw which only measured 14 inches, and I still managed to get a lot accomplished with that saw. As long as you aren’t using this saw for heavy commercial use it should be more than capable of getting the job done. In the chainsaw world a manufacturer would be sabotaging their own product if they didn’t include an automatic oiling feature which has become the accepted norm, so it’s not surprising that this machine is equipped with one. This feature ensures that the blade and chain receive the appropriate amount of oil to keep working at their best. Without it the life of your chainsaw would be significantly reduced. Safety should always be in the back of your mind when you’re using a chainsaw. They are potentially very dangerous tools if they don’t come with certain safeguards in place. This Sun Joe chain saw is equipped with a safety guard on the handle that protects your hands from flying debris and potentially serious injury. Kickback is another safety concern that you should be conscious of when using a chainsaw. Again, this model has built-in features to minimize the possibility of injury from this type of problem. When the saw senses an unnatural kickback motion it’s designed to brake automatically, preventing the loss of any limbs or even the loss of life in extreme circumstances. 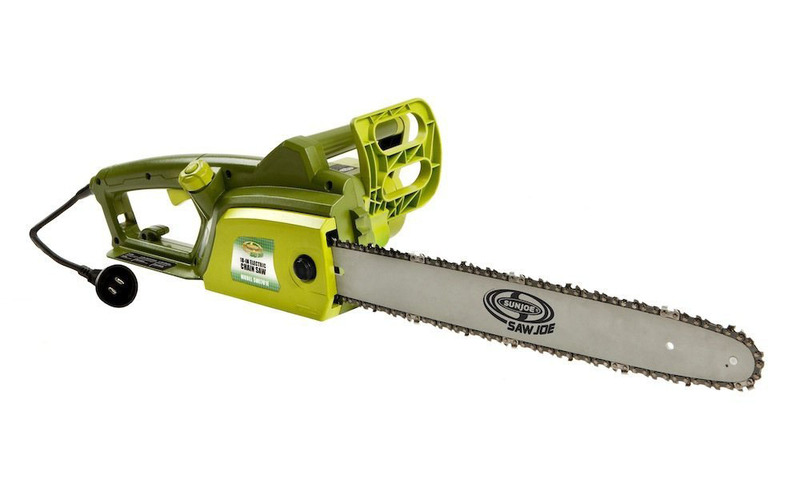 As far as weight is concerned the SWJ701E is about average for an electric chainsaw. It weighs in at just under 10 pounds and that makes it fairly easy to maneuver. Gasoline chainsaws are typically much heavier – often weighing 25 pounds or more. That’s a considerable difference and another reason that electric chainsaws are a little safer; they reduce the amount of weight stress placed on the body. The Sun Joe SWJ701E is also designed with the comfort of the user in mind. It has an ergonomic handle design that makes it feel quite natural as you grip the machine. It would have been nice if they’d included some rubber on the handles as well to minimize vibration, but that isn’t as big of a concern with an electric chain saw as it would be with a gasoline-powered model. When you’re looking at an electric power tool you can’t ignore that they’re much easier to start, and this model’s no exception. There’s no cord to pull, you just plug it in, pull the trigger, and off you go. You do have to put up with dragging a cord around behind you though, so it’s not all positive by any means. The other inescapable truth of any electric power tool, including an electric chain saw, is that they have very little impact on the environment. This is a zero emission product and that’s a key selling feature for a lot of people these days. Even the most efficient gasoline-powered engines produce some emissions, so the electric option will always be better in this regard. This is a chain saw with a number of critics. There are two main issues that seem to occur over and over again. First of all, quite a number of customers have had problems getting this chain saw started after only its first couple of uses. Secondly, the chain seems to come off quite frequently for a lot of people. These are important defects that seem to crop up far too often. The Sun Joe SWJ701E 18-Inch 14 Amp Electric Chain Saw is great because of its affordable price, but it seems to have a few too many mechanical problems. There aren’t any products without a couple of critics, it’s just that this chain saw seems to have one too many. Other options exist that are just as affordable and offer better value for the money.